The interrupt library is used for interrupt handling capabilities of Toradex module. We provide free [IntLib] including demo source code. The setup on the Colibri Evaluation Board V3.1A can be seen here. 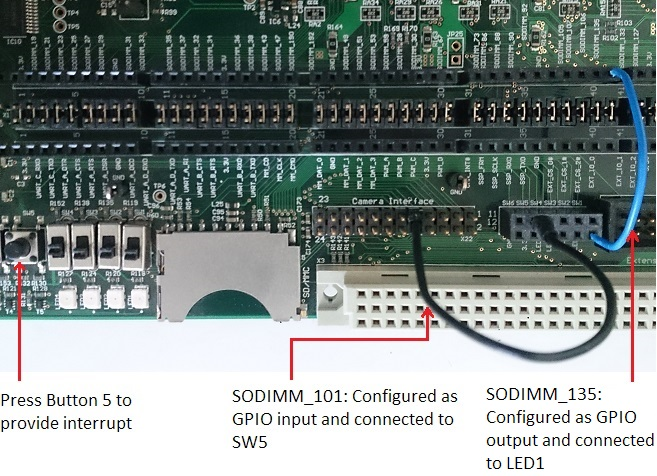 This application demonstrates the use of Interrupt library by capturing an interrupt at GPIO pin (SODIMM_101) and blinking an LED every time an interrupt is captured. Set SODIMM_101 (connected to SW5) and SODIMM_135 (connected to LED1) as GPIO input and GPIO output respectively. 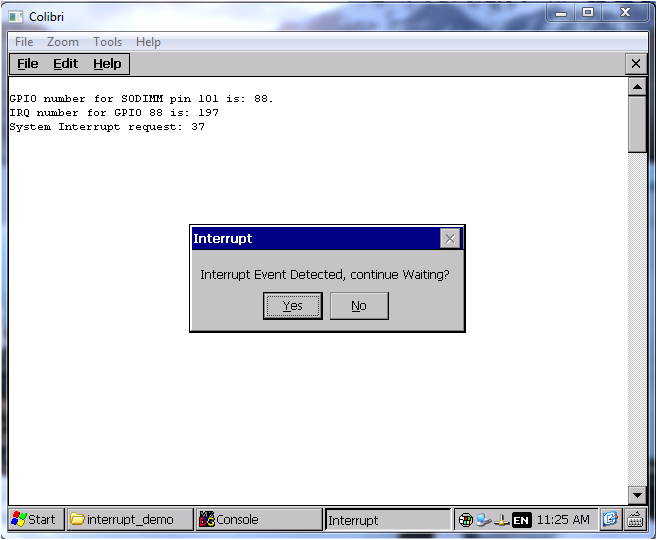 Get Interrupt number for GPIO number (for SODIMM_101). Configure interrupt to detect rising edge. Create an event or check for an existing event for which the system will wait. Get the corresponding System Interrupt number for the Interrupt number obtained in step 2. Link the event created in step 4 with System Interrupt obtained in step 5. If the event occurs, the system asks if it should continue waiting. On choosing "Yes" it changes the status of LED (ON or OFF). Else on choosing "No", interrupt is de-initialized. Build and deploy the solution. 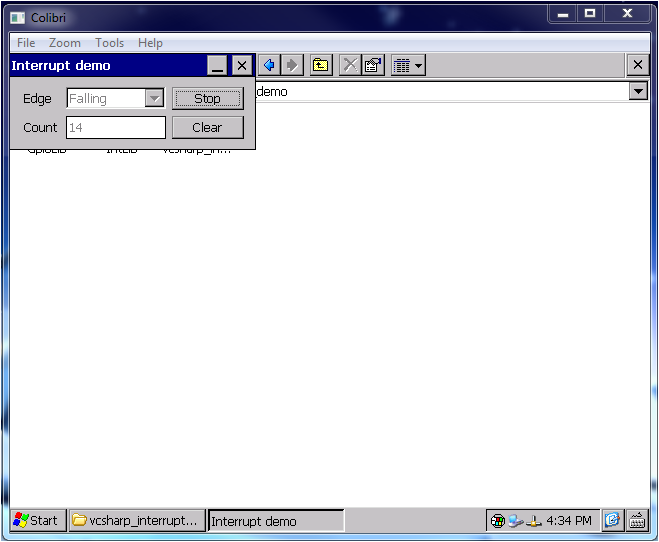 Go to My Device > Program Files > interrupt_demo and run the application. Navigate to Solution Explorer in visual studio > Right Click on Solution > Properties > Devices. Uncheck "Deploy the Latest version of the .NET Compact Framework (including Service Packs)". Build and deploy the project on your WinCE device. Download and Install .NET Compact Framework directly to the FlashDisk of the device from here. Go to My Device > Program Files > vcsharp_interrupt_demo and run the application.